Speeder is the brainchild of company CEO David Mayman who also co-created the only FAA approved turbine powered JetPack. In 2015, Mayman amazed the aviation world with his first public flight around the Statue of Liberty which launched a multi-country world JetPack demonstration tour. Speeder will Save Lives. It’s also Cool. The elegantly contoured Speeder features the sleek clean aesthetic of talented Swiss designer Yacouba Galle of Yacouba Design Studio and was conceived by Mayman with a core mission: Save Lives. “The primary purpose of our new aircraft is to save lives,” said Mayman. “Multiple studies have shown that for every minute saved in emergency response time, a significant decrease in victim mortality occurs. The quicker a First Responder can reach a patient in need of critical treatment, the higher the chance for a successful recovery outcome. This is true whether the medic is delivered to the patient, or the patient is transported to a hospital. The same is true for military applications. Quickly moving medics onto the battlefield and injured soldiers out of danger can be difficult and highly risky for helicopters and their crews.” The compact, rotor-less Speeder can fly faster than a drone or even helicopter and safely operate in spaces too small for a helicopter. The Speeder can be converted from pilot configuration to cargo configuration in less than 10 minutes. Speed Saves Lives ... and the small, fast, heavy-lift Speeder can be operated as an individual rescue vehicle or swarmed in a group to rapidly meet the appropriate response force needed for any unique situation. They can be deployed from and to most environments, and the advanced flight management software enables anyone to fly a Speeder with virtually no pilot training or experience. About Us: JetPackAviation has been pushing the technical limits of personal VTOL flight for more than a decade. 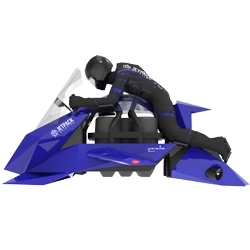 It is the first and only company to build a practical, personal, FAA approved turbine powered JetPack. The company is currently working under a Cooperative Research and Development Agreement with the US Special Operations Command (USSOCOM). JPA offers JetPack Pilot training, JetPack presentation flights, and a demonstration JetPack Race Team.